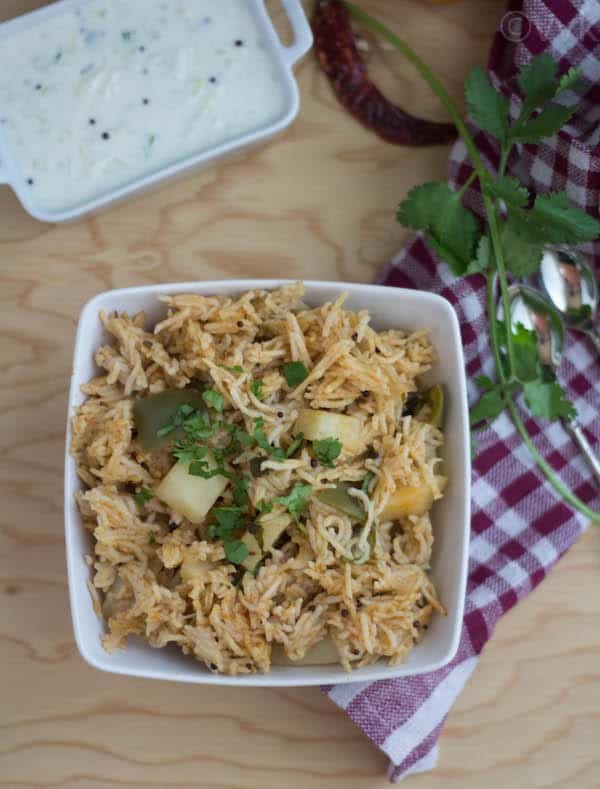 A great lunch box rice recipe prepared with capsicum and potatoes spiced up with vaangi baath powder. Check out the detailed video below to see how I made this potato-capsicum rice in the pressure cooker and how I served it. The new academic year has begun so does the lunch-box season. We love variety rice recipes in our lunch box, and they are easy to prepare too. 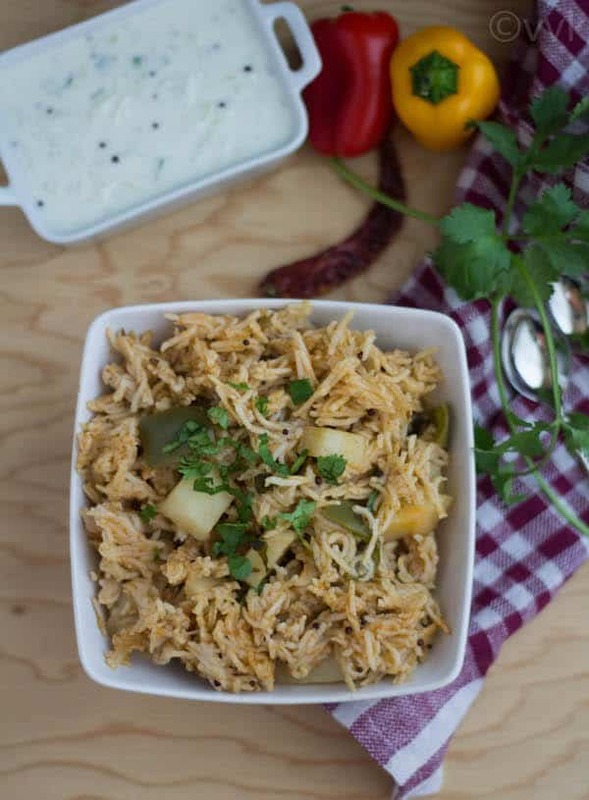 You can whip this potato-capsicum rice with raita in less than 30 minutes. I know you need to chop the vegetables, but capsicum and potatoes are not hard to cut either. 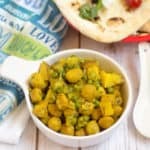 I love the combination of potato and capsicum and if you like the combo, then check this potato capsicum curry with panch phoron masala too. And this meal falls under the category of “Meal for one” or “Bachelor Recipes” as well. 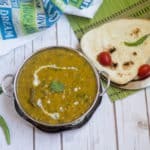 You can replace potatoes and capsicum with any veggie of your choice and prepare this recipe. 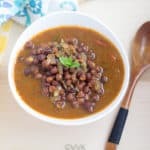 I spiced this up with vaangi baath powder, and I love the versatility of vaangi baath powder. I use it in my BBB and also for other rice recipes like ridgegourd rice, zucchini rice, etc. 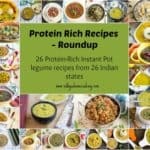 It’s Friday, and it means it is time for my Indian Vegetarian Meal Plan Video too. In today’s menu, I have this potato-capsicum curry with cucumber yogurt raita. Please do subscribe to my channel and share your feedback. If you want to print the recipe, scroll down and print the recipe card. 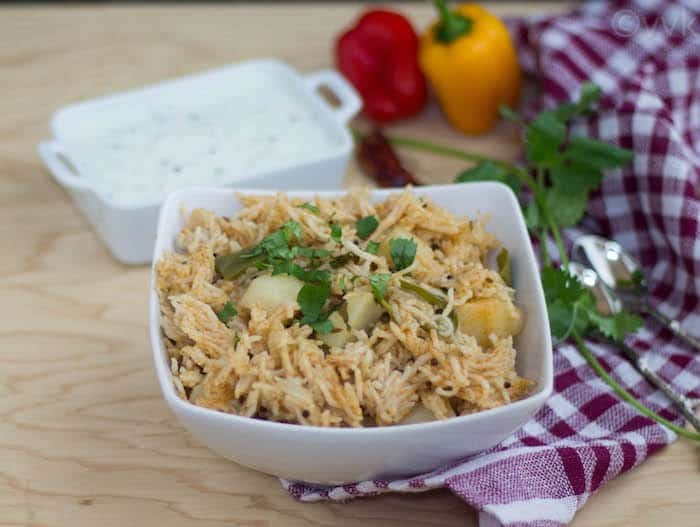 How to make Potato-Capsicum Rice? Wash the rice and soak for at least 15 minutes. Chop the potatoes and capsicum and soak it in water to prevent the discoloration. Heat the pressure cooker or pressure pan and add oil. Add mustard seeds, cumin seeds, and hing. As they start to splutter, add chopped onion and cook until they are translucent. Now add the chopped potatoes and capsicum. Let it cook for 2 minutes. Then add salt and vaangi bath powder. Now add the washed rice and water. Add the chopped cilantro and mix gently. Pressure cook this for just one whistle. 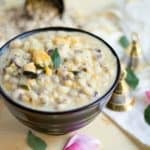 Allow the pressure to release and after that fluff the rice and serve it with your favorite raita. If you can’t source vaangi baath powder, you can use sambar powder and garam masala combination. You can use regular rice instead of basmati rice. Depending upon the quality of the rice, adjust the cooking time. As always adjust the salt and spice as per your preference. 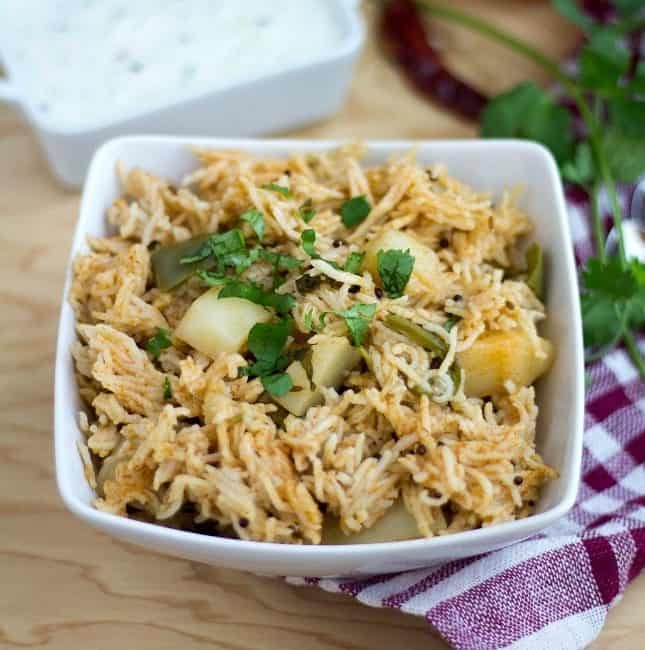 A great lunch box rice recipe prepared with capsicum and potatoes spiced up with vaangi baath powder. If you can't source vaangi baath powder, you can use sambar powder and garam masala combination. Nice rice but why did you have used here Vangi Bhat POWDER? I like the flavor of it. So went with that. Delicious one. Sure must taste awesome. Perfect one pot dish to make yourself. It is so easy and delicious. Lovely rice. Vangi bhath powder comes in handy to prepare a lot of rice dishes with several veggie combinations. Thanks a lot shwetha. If you have a picture do send it across. No problem :-) Thanks for trying. Love this combination in anything, such a flavourful rice. I like repurposed ingredients. Makes the dish so flavorful. Never used vangi Bhaat powder in capsicum rice.Sounds so flavorful .. Very good one, I am sure it would have tasted great! I always feel that the addition of capsicum adds flavor to any kind of rice. 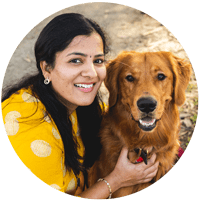 very nice :) I love the capsicum rice my mom makes – she always grinds the powder but i skip it due to lack of time/motivation :) using vangi baath powder is a great idea! will try it! Awwww niths welcome here n you made my day. I must try making rice in a pressure cooker…the capsicum rice looks delicious. Lovely use of vangibhath powder .. This is one of my fav !! Store bought powders come handy when we are in a rush! Lovely recipe!